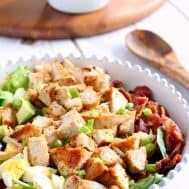 This Paleo Chicken Cobb Salad combines all your favorite fresh healthy ingredients and adds a spicy kick with Whole30 friendly buffalo ranch dressing, made 2 different ways depending on your preference! 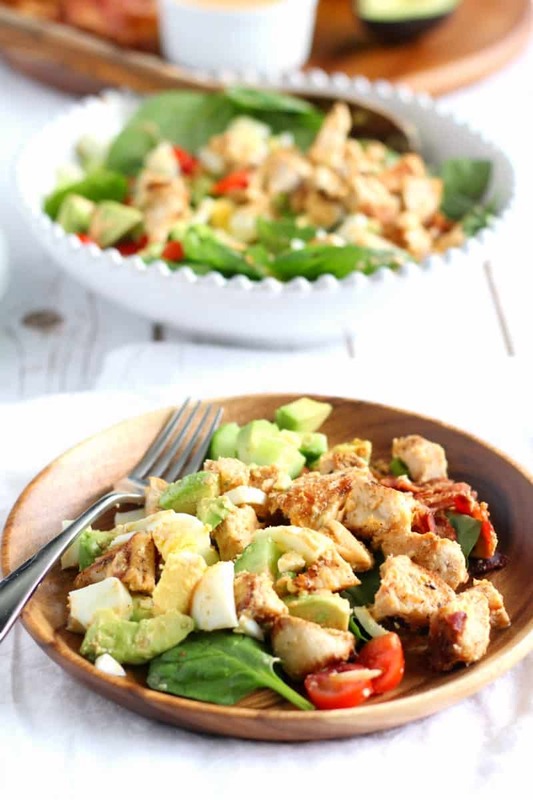 Perfectly seasoned chicken, hardboiled eggs, bacon, avocado, tomatoes and fresh greens with a creamy spicy dressing that makes the perfect healthy summer dinner. 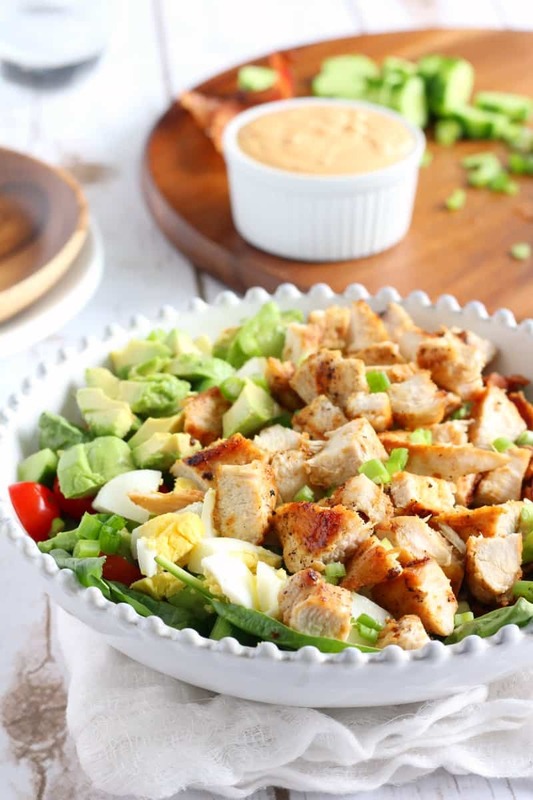 So which came first, the Paleo chicken cobb salad or the buffalo ranch dressing? Any guesses? If you’re new to the blog, you might not know that I LOOOVE my homemade mayo. And yes, I’m also fine with the fact that it has a raw egg in it – as all homemade mayo does. I make sure my eggs are fresh and I don’t keep my mayo for longer than a week in the fridge. Anyway, I’ve learned that while many people share my love for homemade mayo and mayo-based dressings/dips (like my ranch!) some people want no part of it. In fact, some people cannot believe that anyone would eat anything with a raw egg in it. I don’t know about you guys, but back before homemade mayo was a thing, I didn’t exactly think twice about eating raw cookie dough before baking. Just me? But now I’m on a tangent! Point is, I respect people who can’t do the raw egg, and that’s why I created a Paleo buffalo ranch dressing that you can make two ways – one with mayo as a base, and one with coconut milk as a base. Holla! And get this – they’re both Whole30 friendly and they both taste awesome! Says Adam, my husband AKA the pickiest grown-up eater that I know. 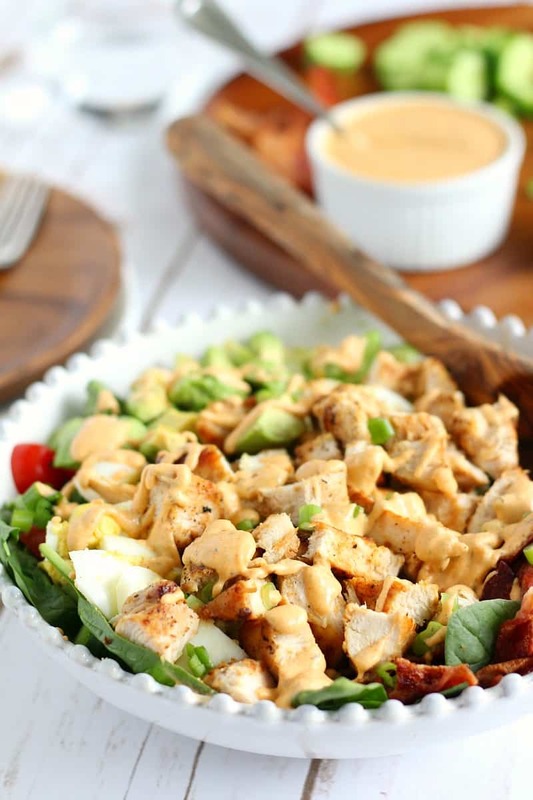 So in short, the buffalo ranch came first, but the Paleo Chicken Cobb Salad is the perfect complement. You get perfectly seasoned chicken (you’re cooking it in bacon fat AKA you are WINNING!) with bacon, avocado, hardboiled eggs and lot of veggies. And then the dressing, have I mentioned the dressing?! I will give you my honest opinion – I don’t even know which version I liked better. Trust me, even I’m shocked! 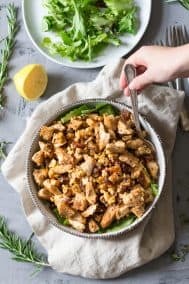 The paleo chicken cobb salad itself is very straightforward and contains all the goodies you’d want in any cobb salad (minus cheese, but the dressing more than makes up for that.) You can easily cook the chicken beforehand to make this a quick throw-together meal. I actually cooked the chicken and prepared the dressing the night before so I could quickly put the salad together for photos. You can heat the chicken first or serve it cold – your choice! 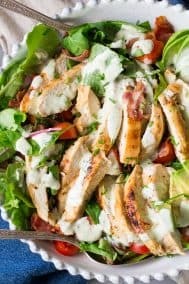 A Paleo Chicken Cobb Salad with all your favorites plus a creamy buffalo ranch dressing that you can make two ways - one with homemade mayo as a base and the other with coconut milk - both delicious and Whole30 friendly! Reserve 2-3 tbsp of bacon fat to cook the chicken, or use your cooking fat of choice. Season the chicken tenderloins with the salt and pepper, onion powder and smoked paprika and heat a large cast iron skillet (or grill pan) over med heat. Add the chicken to the pan and cook about 5 minutes on each side, adjusting heat as necessary. Make sure the chicken is cooked through, remove from heat, and set aside. Once chicken is cool enough to handle, chop into bite-sized pieces. To prepare the dressing, simply whisk together all the ingredients in a medium bowl until fully combined. 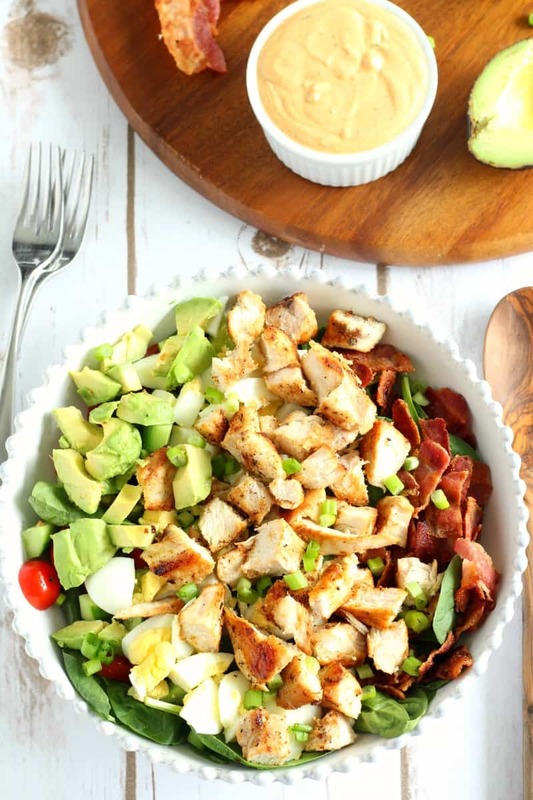 Assemble all the salad ingredients, chopped cooked chicken and crumbled bacon in a large bowl (avocado last so it doesn't turn brown! ), and garnish with green onion. Serve with the dressing on the side, or spoon the dressing on right before serving to toss with the salad. The dressing will be very creamy either way! Store leftover dressing in the refrigerator in an airtight container for up to 4 days. Enjoy! *To avoid the avocado turning brown, cut in open and either chop or slice right before serving. Do you get nervous eating things with raw egg? Even raw cookie dough? Have you gone savory with coconut milk? I’ll be doing it more, I think! All cookie dough is “edible,” as far as I am concerned. And if you get a little something extra from it, well then it is just the gift that keeps on giving, lol. This looks sooooo good. Love the new use for coconut milk! I’m liking the sound of the coconut milk ranch!! This salad looks delicious, I can’t wait to try it! I was very skeptical but it turned out great, one more reason to love coconut milk! Oh yum! I’ve been craving salads big time lately. I need to give this a try! I make a salad like this for my son lately only I don’t make my dressing ( he doesn’t trust me lol). looks so good! I never thought I’d be making dressing, it’s been a while since I’ve had anything bottled now! Haha, have you seen my blog? Of course I’ve gone savory with coconut milk! That’s usually the way I do it! But I have to admit that I made 2 sweet recipes this week with it 😛 O the irony! I’ve done savory soups with coconut milk but never dressing–what a good idea! Eating raw egg makes me nervous…but I’ve eaten a lot of cookie dough with raw egg in it and didn’t care. It’s probably a mental thing! I definitely think it’s a mental thing! Somehow cookie dough isn’t “real” lol! Yup I used to eat that too, I think we used to buy it and then eat it before we got a chance to bake! This salad looks so good! Definitely going into my summer menu cycle!! I’m trying to work the Paleo diet into my family’s life, and recipes like this will certainly be satisfying to my hubby and boys! I think everyone does, right?! Lol, hope you like the recipe! OH YUM! Can’t wait to try the coconut milk version- looks so good! I love chicken + eggs + avocados together! 🙂 I always need to get all three on the fork and shove it in my face lol! Yup cannot beat that combo! I feel like the whole raw egg deal really isn’t that much to be concerned about. I didn’t realise it was such a big deal until we were in the US and realised some people are totally overcautious – to the point they won’t even eat fried eggs unless they’re over easy etc. When I was a kid I always ate raw cookie dough and cake batter – and I still do sometimes if I feel like it (though these days for some reason I just don’t like it!) and I haven’t died yet, haha! Lol I know, most people around here are shocked when they hear people eat raw egg yet cookie dough gets a pass somehow, maybe because it’s not “planned” ? not sure! You’ve inspired me. Busting out the homemade mayo recipes this weekend. I NEED THIS in my life. RAnch is my fav! how do you know these things? Ranch is totally my favorite too, I have it around pretty much always! 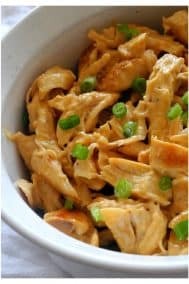 This chicken salad looks so much better than any other chicken salad I’ve ever seen! Heck sometimes I made cookie dough for the sheer purpose of eating it raw. I love a good Cobb salad. Of course I would ditch the chicken, although keep the bacon, and toss in some blue cheese for protein (and really because I adore cheese). I’d take either dressing though. What do you mean by brown mustard? Spicy brown mustard, not the bright yellow kind. So many thank-yous for this salad dressing recipe!! It is amazing. My husband loves it and he hates just about everything I have made during my whole 30s! 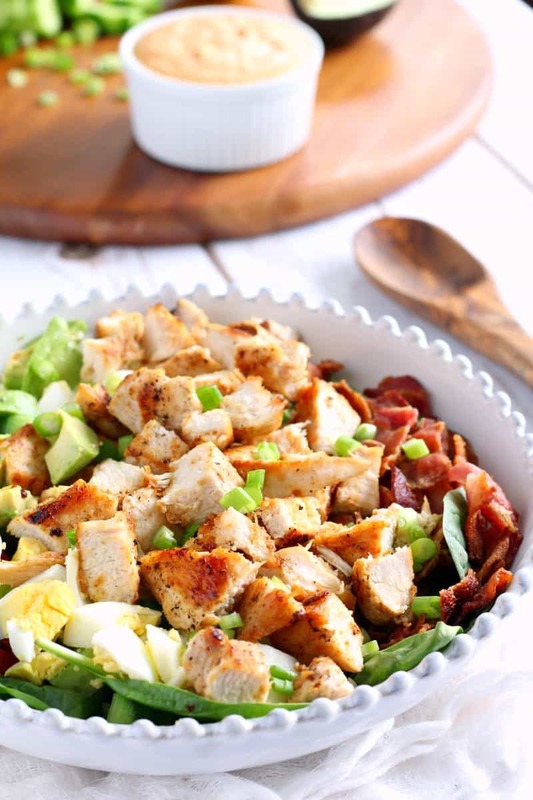 He doesmt like much of what I cook any other time for that matter… he is a very picky eater and we have opposite tastes on just about everything BUT this Cobb Salad and dressing is something we can both agree on. We tried the dressing on taco salad tonight and it is ever so yummy. I use it as dip too. I love the coconut milk version. I tried it with avocado mayo and it was good but I feel the coconut milk is the way to go for me! I am almost tempted to try your biscuit and gravy recipe but that stinker husband of mine claims I shouldn’t even attempt a “healthy” version. I just might have to prove him wrong 🙂 In his defense though , we have ended up tossing a few concoctions all together over the course of this Whole30…you just can’t trust every recipe you find on Pinterest so I am grateful we found a winner with this one ! That’s awesome! Couldn’t be happier to hear about pleasing picky eaters!! What is the serving size for the dressing? I’d say a couple of Tbsp. What are the calories for this?